First in a series of articles on upgrading your older Grand Banks to a more maintenance-friendly vessel. We will be covering lots of creative ways to achieve this goal. 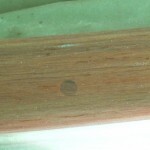 This article focuses on teak rails and how to spend more time boating and less time varnishing. Come back later to see how we can convert your current teak rails to stainless. 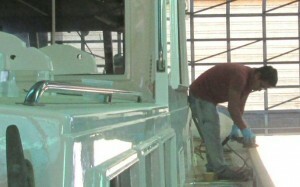 A Grand Banks owner asked us to come up with some maintenance reducing steps for his boat. One of the options is to eliminate the varnished teak cap and teak hand rails. 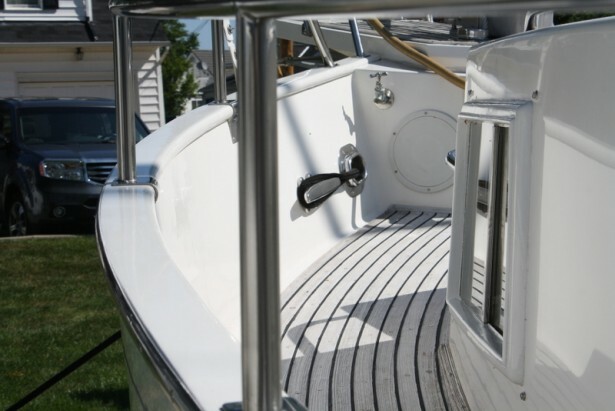 The way to do this is to replace the teak handrail with stainless railing and while the stanchions are off the boat to strip the varnish from the caprail, prime the fully sanded wood with epoxy and coat with Grand Banks White Awlgrip. As you can see, in addition to the labor saved the end product is quite attractive.